Contrary to a conventional closed loop system, with the Improved Closed Loop or Integrated testing/cleaning system, the hydraulic oil is continuously cooled, filtered, degassed and dehumidified. This system is a standard feature of all hydraulic equipment of Sun Test Systems. The result is regenerated clean and de-aerated hydraulic fluid in the aircraft after hydraulic testing. Also maintenance time on the hydraulic system of the aircraft is reduced (less leakages, less replacement of hydraulic fluid, less waste) and operational reliability will increase and handling of the aircraft is improved. With the Improved Closed Loop system the complete content of the reservoir continuously circulates through the filter and cooling system and through the vacuum system. From this circuit the aircraft system is fed and the polluted aircraft oil is being guided through the return pipe to this cleaning circuit. Also through the mixture with degassed hydraulic oil the volume of dissolved gas in the aircraft hydraulic system is being decreased which results in a safer aircraft. This system can be found in all Sun Test Systems hydraulic test trolleys and is suitable for all types of aircraft and helicopters. Maximum cooling of the oil through continuous passing through the heat exchangers. This especially is an advantage when working in high ambient temperatures and/or if low oil temperatures are required. AA-GIO®. This system is being used by the German Air Force to determine if, and how much, free gas is present in an aircraft hydraulic system, and approx where in the system this gas is located. 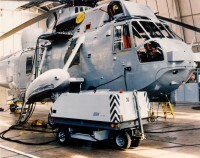 AA–GIO® is in use on the Tornado, Transall, SeaKing and CH53 helicopters and maybe in future on the Eurofighter and Tiger. It is applicable and useful to all fighters since those aircraft especially are at risk due to their flight manoeuvres and high dependency on uninterrupted hydraulic pressure.